The annual Sark to Jersey rowing race has been postponed for the second time this summer. Organisers say winds in the Channel Islands area will be even stronger on Saturday than the original date. The race has never been completely cancelled in its 46-year history and this is the first time it has been postponed twice. A "back to basics" version has now been set for September 15 without the usual social events. "We're determined to keep the spirit alive and maintain the tradition," said co-ordinator Clive Russell. "We want to run it in some form even if we only have a few boats. "The Sark to Jersey is the race that everyone wants to do and it's the race that gets many people into rowing." More than 60 crews had originally registered to compete, including rowers from France and the Netherlands. 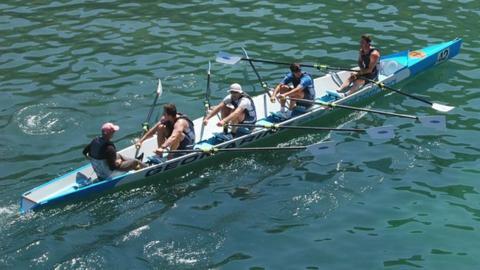 Competitors from Guernsey have dominated in recent years, with crews from the island claiming the top four positions in 2011. Joseph Paul and Paul Isaacs are the reigning champions, after winning by 24 seconds last time.